Silhouette Chipboard & a Giveaway! Today I am sharing a new product that you might not be aware of. 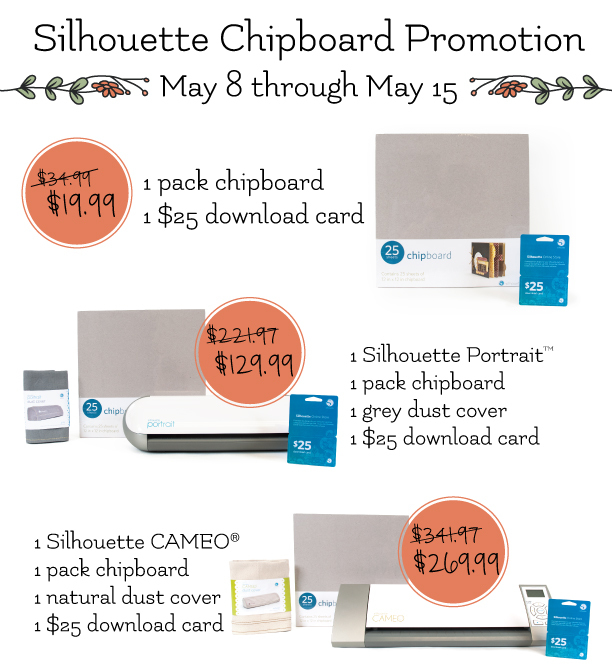 It is chipboard that you can cut with your Silhouette machine! Fun huh! Just another great way to add dimension to your projects. On this card I adhered Adhesive Sheets onto patterned paper and then adhered it onto the chipboard. I then set my Silhouette blade to 8. The word Hello is pretty detailed and it cut wonderfully! Now for the fun stuff! Giveaway & Promo time!! One lucky commenter will receive this pretty little machine! WOOOOOOO HOOOOOOOO!!! You have until midnight PST Sunday to leave a comment telling us why you need this machine. So to get these great deals you need to go HERE and enter the code REVIEW at checkout. You don't want to miss it!! Awesome giveaway! I think this would be a good intro into the silo world for me! Thanks for the chance to win! I would love to win this! I've never had an electronic die cut machine and would love to step into the modern world. Wow! What a fantastic giveaway. I can't think of a fantastic reason why I need it. But I love this hobby and I love to scrapbook and this machine will definitely be a welcome tool in my craft room. Thanks for the chance. I would love to replace my Cricut with this fantastic machine - every time I see an amazing LO with intricately cut titles or a beautiful background or some fancy die cut, it is always Silhouette. I know it is bot nice to covet things but boy do I covet this machine! What an awesome giveaway! I love the details that were cut in the Hello! Love how you can create things like this!! Thanks for a chance to win. This would be amazing to win! It would take my craft projects to the next level! Love!! I could make so many awesome things with a Silhouette Portrait! Thanks for the chance! ~ Jessica D.
Wow! That's a giveaway! That card is ADORABLE! I would love to have this machine and some chipboard to cut titles and patterns to use on all of my projects! The possibilities are endless! I keep seeing more and more information on these machines, and I think they sound AMAZING! Thanks so much for a chance to win! I need this machine ok I WANT this machine! I love adding special touches to my scrapbook pages! This is the perfect machine to do it with! Beautiful card! I need this machine because it would totally take my cardmaking to the next level!! Crossing my fingers!!!!!!!!!!!!! Beautiful card!!! Thanks so much for the chance to win! I don't have a die cutting machine but could really use one. I would love to give this to my son Parker's elementary school. I know they would be able to use it on a daily basis! I already own one and love it!!! The possibilities are endless to create fun and fabulous projects with the Silhoutte! Thanks for the chance! I would love to win this to be able to create my own die cuts and not have to rely on cartridges. Your card is so pretty! Thank you for this great opportunity to win! That would be AMAZING! Love your card. Thanks for the great tips. Love the Scrap Review! #1 on my want list. I've done a lot of research and this is the perfect electronic cutter for me.Thanks for a chance to win. My mom recently started scrapbooking and seeing that it's mother's day soon, I thought that this would be the perfect give for her. I own a Silhouette and my mom always admire the amazing thing this machine can do. I would love for her to also experience the awesomeness of the Silhouette!!! Another awesome feature of the silhouette machine! This is the trendiest machine on the market today, and there's so much you can create with one! I'd really love to own one of these gems, so thank you for the chance!! 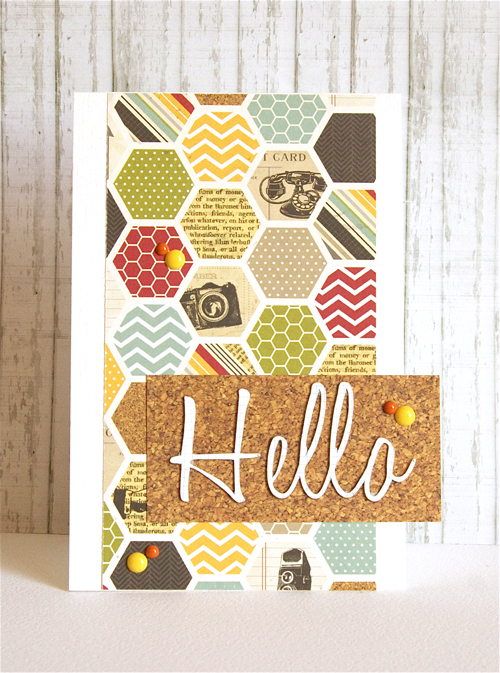 I love all those hexes and what looks like cork on your card too!! I have so been wishing to replace my cricut with a silhouette. i have been drooling over all of the awesome things people have made. I would love to be able to make little surprise gifts for those serving our country! I had no idea it could cut chipboard! Just another reason I NEED one. I have a million projects that I would love to do with my daughter - custom cut alphabet? Yes please! I do not have a "machine" and have decided if I get one to get the Silhouette! Seems less complicated than others and can use lots of types of dies! I certainly don't want the silhouette. I NEED it. Very badly too I might add. I'd scrapbook, make cards, make gifts, and decorate my home using a cutter! Oh, what a lovely prize! I would love to win it because I could use it for scrapping, sewing, and making mixed media art! I love the versatility! Oh my goodness, I need this machine so that I can cut and create all those amazing titles, embellishments, and 3D projects that I see on everyone's blogs! Wow, what a fantastic giveaway! I would love to win a Silhouette and create layouts, cards, mini albums and tons of projects! I have been thinking I need one of these machines. It would be wonderful to win it! I have been hearing so many great things about the Silhouette lately it just makes me think I need to toss out my old Cricut. Pick me! Pick me! This would be so much fun!! Awesome! I love how cleanly the Silhouette cuts intricate designs. i would love to use this machine for scrapbooking! I want to have a Silhouette so badly. I love that there is chipboard now for it. Thanks for sharing about that and for the chance to win. What fun it would be to have that sweet little machine! I love going to crops, and it would be so easy and portable to take along with me! What an awesome giveaway! Love that it is portable! I have been following Silhouette for some time but haven't been able to purchase this! Thanks for the chance to win one! Great giveaway. I have been wanting this for a while. Love that it is portable. Why do I NEED this Silhouette??? Because I have no machine to do the wonderful cutting this machine does!!! I could go crazy on my layouts and cards if I had this! thanks for the chance to win! thanks for the chance to win a great gift! Wow! Love this give away. And I NEED the Portrait so I can carry it to crops with me and cut all my images! I need it to be able to create die cut backgrounds and titles! I can't believe how cleanly it cuts chipboard! Thanks for the chance! Woohoo- what a great Mothers Day gift this would be! Thx for the chance! I think I am loving this machine -- small footprint, electronic cutting,intricate designs --what is not to love! Love the beautiful card you made and thanks for the opportunity to win. I would love to win this to create fun things for our women's ministry at church and to do some projects with my daughters-in-law! I would totally love to win one of these little babies! I need this machine because I don't have an electronic cutter & feel like I'm missing out on so many opportunities to use one! I would love to share this machine with my Mom. She inherited my old Silhouette and just loves it! I would love to win this! I almost never scrapbook without using a cutting file! Would love to have this little baby for crops & taking to friends house. Thanks for the weekly files... collect to one day use. I'd love the chance to win! I'm majorly behind in my scrapbooking and this would inspire me to sit down and get caught up. Thank you!!! What a generous giveaway! I would love to have this because the only die cutting item i have is a 2x2 Quickutz Squeeze! I really would love to cut out words or titles for my pages and cards, and so cool that it cuts chipboard! This really is a great giveaway! I would love to win this, not for me, for my 13-year-old daughter. She has such a natural eye for the art of scrapbooking & I encourage her as much as possible. I have ovarian cancer & she is very active in fundraising events such as Relay for Life; she likes to incorporate Teal (OC's awareness color) into her projects just for me. Right now, ALL her scrapbooking is freehand. I think, actually I know, the addition of this Silouette would open-up a whole new facet of scrapbooking for her!